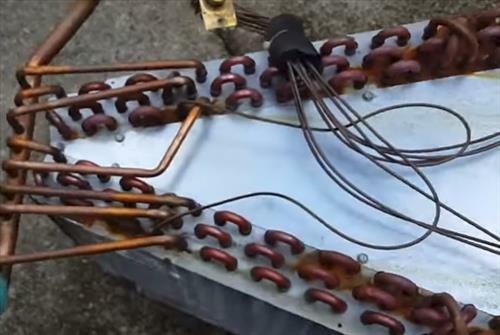 Finding a refrigerant leak on a HVAC system can be easy at times and other times almost impossible. One method is to use a bubbly liquid sprayed around were a possible leak is to visibly be able to see the leaks location. Using this method does work but often requires more work than is needed, especially for small difficult to find leaks. Also If a system has a very low charge the unit will need charged with Nitrogen to raise the pressure. 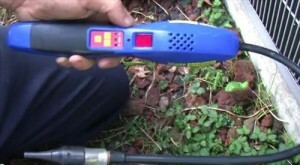 Another method to find hard to spot leaks is to use a leak detector that will detect refrigerant and notify the user. Every HVAC tech will have their own favorite method of finding a leak. In my experience using both the soap method and leak detector method have their advantages. In the past leak detectors were notoriously bad at finding a refrigerant leak but technology today has changed with many good ones available. Refrigerant leak detectors vary in build and cost. What fits one technician often doesn’t fit another. 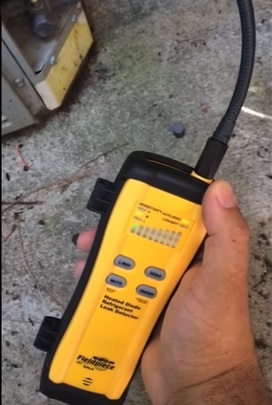 The best method to find the right leak detector that fits you is to read the reviews on Amazon from real techs in the field already using it. Fieldpiece is a well known HVAC tool manufacture including the SRL8. It is good unit that is used by many professional HVAC technicians. It can sniff out most any refrigerant CFCs, HFCs, HCFCs and other blends. This unit is made by Yellow Jacket which is another well known HVAC equipment manufacture. It is also built for professionals to find refrigerant leaks on a HVAC system. It is a good unit that has helped many tech find and fix leaks. This one is cheap compared to the other leak detectors. The cost makes me a little wary of how well it would work in the field. While it cant be compered to the top name brand units it would be good in some scenarios, just dont expect wonders.